What matters most in Politics? I put up a teaser not too long ago, asking my Facebook friends to guess my reply to a reporter on his question as to when I was going to do ground work. My answer shocked him when I said that I was not going to “walk the ground”. It appears that the “default thinking” of most people is that politicians, whether from the PAP or the opposition, should “walk the ground” in order to “win votes”. I explained to him clearly that I was not going to play the games according to the “indoctrinated rules” set by PAP. PAP has not only drawn the electoral boundaries to its advantage, but has also set up “invisible political boundaries” to its own advantage. They have always been trying to “mislead” and “misguide” political engagement via subtle “brain washing”. This started way back in 1981, right after JB Jeyaratnam won the Anson by-election. The almighty PAP has lost its very first seat in one and a half decade and it was only natural that the late LKY jumped with anger. The often dull parliament sittings had suddenly become all fiery with exchanges of missiles and dramas. It was apparent that the total dominance of PAP in the past immediate decade had made it complacent and lost the art of debate in the face of a strong and fiery opponent, JBJ. Parliament in the past could be an “empty rubber stamp” without the need of any real debates or even the need of attendance of MPs and Ministers. But JBJ had changed all that to the point that even LKY himself had made it a point to attend parliament whenever JBJ was making his speeches of criticisms. In 1984, PAP lost another seat in Potong Pasir and this led to a serious rethinking of political strategy. The strategy? Town Council Management entrusted to MPs was the solution. This was an attempt to divert voter’s attention from the real core responsibility of an MP in parliament to drain their energy and attention into municipal issues. But the PAP, knowing well that they do not have strong MPs in parliament, relied on their abundance of resources to take care of municipal issues by subcontracting out to professional estate management companies. In doing so, they tried to change the focus and direction of political engagement towards municipal matters instead of policy debates and law making in parliament. Ultimately, PAP has successfully to mislead voters to think that they should put most of their energy in knocking doors, convincing voters they can run town councils instead of putting up strong debates, policy ideas and scrutiny in parliament. After the opposition won some seats, they will compete with PAP which has the whole machinery of People’s Association (PA), in conducting durian tours, temple tours, organizing events and other worthless events instead of spending most of their time in policy research and debates. In the end, we have political parties who end up doing charity work, giving out goodies, organizing events instead of doing proper political work of analysing, researching and commenting on critical political issues. Instead of looking at the political views, ideologies or ideals of political candidates, we have voters voting blindly according to party branding or whether candidates “walk the ground”! This totally misguided perception and concept of politics is the direct result of PAP’s subtle brain washing. This is the reason why we ended up with lots of empty chairs and empty tables in Parliamentary sittings most of the time. When voters and politicians have wrong and misguided priorities in politics, that’s the end result we will get. In GE 2011, I changed the methodology subtly. I didn’t knock on all the doors in Tampines but decided to ignite the fire on policy issues, mainly HDB issues. It set on a fire which ran wild and benefited all opposition. What we need is more public political discourse and education, not more door knocking saying “Hi” and “Bye”, shaking hands, kissing babies and making people feel flattered to have a picture taken with a Minister so that they will vote for you. So next time, anyone of you start to talk about “walk the ground”, “start campaigning”, think again. Quite an insightful article by GMS….esp about PAPigs MPs going around kissing babies and showing their fface ONLY during Erection time. Once the Erection is over, No Sound No Shadow from most if not all the PAPIGS MPs! Btw whenever the PAPIGS MP’s Advance Party come knocking on the door to announce the Grand Arrival of their JLB MF Bugger, I always tell them to go fly kite and fiack spider! Come this GE, I may have to borrow the Rude Extended Middle Finger from Holee Jinx! WHAT sgs need urgently are LEADERS WHO WANT TO SERVE THE PEOPLE AT ALL TIMES and not trying to win hearts only during ELECTION TIME. LEADERS MUST IDENTIFY WITH THEIR PEOPLE ALL THE TIME OR THEY WILL NEVER BE ABLE TO LEAD EFFECTIVELY. OURS talk about *LESSER MORTALS* AND THEIR *UNCARING FACES*.THIS IS NOT GOOD. AND,that is WHY over recent years,SG N sgs are falling apart despite and inspite of the various ostentatious FACADE$$$. GLITZY BUILDINGS AND WASTEFUL FIREWORKS DO NOT MAKE A NATION even on NATIONAL DAY,do they? it is the COMMON PULSE OF OUR HEARTS TOWARDS OUR COUNTRY AND EACH OTHER THAT COUNTS. WE HAVE LOST THE COMMON PULSE indeed. 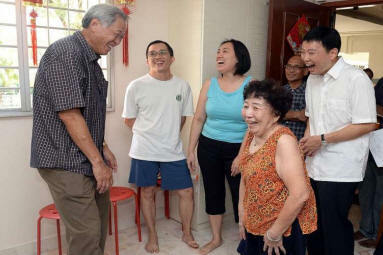 I don’t know about the rest of you but Goh Meng Seng’s strategy of not knocking doors backfired on him. For one, why didn’t he get elected in 2011 or 2015 if his strategy is better than knocking on doors? And did WP go around knocking doors in 2011 before they won Aljunied? Did they also do it in 2015 to try and retain the GRC? VISIBILITY is very important which is what Meng Seng has forgotten. It’s fine if he doesn’t want to be visible to voters in whichever ward he chooses to contest but come a GE you know all parties are knocking on doors for sure along with holding election rallies and having the crowd roar and cheer just like at a football match. Does this family really thinks that Dr Hen is really interested in their family matters ??? Just look at how “silly and daft” this family members are. If its me,…i would politely decline to be visited by “faked sincerity” and “fake interest” as well as “Fake concerns” ! Of course this family is entitle to their opinion,…but I am also entitle to “judge” their opinion rite ?? The period between 1980 and 1987 saw the great purge of vanguard PAP old guards as LKY ushered in his very own 2G politicians: And “Realpolitik” now overwhelmed discursive political philosophy. I’m all with Goh Meng Seng. Those silly so-called PAP scholars have degenerated politics and the Elections into one of competing over trivial matters such as walking the ground and estate management, missing out on what really matters – policy matters and problems affecting the citizens and the country. How much or what kind of information can a candidate impart over a short door-to-door ground visit chat? That’s the kind of trivial rubbish those PAP candidates dish out on ground visits to detract unthinking Sinkies away from the truly important matters which are more effectively delivered in the form of rally speeches and mass media communications. The PAP candidates have been extremely silent when it comes to speeches, because they have little to say and have little ability to communicate. Also, the police, the judic**ry, the civil service machinery, PA, grassroots, etc. all work for the PAP only. Name us another country where the candidates do door-to-door ground visits? That only happens in Sillypore. If you have read the comments diligently, this was already brought up by some insightful netizens some time ago about local MPs being just councillors in other advanced democracies. In any case, walking the ground wouldn’t make any difference to votes from dafts as seen from so many past elections. Only real pain will do the job. If dafts couldn’t realise in time, it is just too sad for this nation. Goh Ms thinks that with Tan Kin Lian announcing that he would most likely take part in this coming GE will be joining his party. So, no need to campaign la! He forgot that TKL scored the lowest number of votes in the Presidential elections won by Tony Tan and that TKL will not enhance or bring votes to him. TKL a sufferer of lack of “self-esteem” syndrome has one plus factor…he can sing and can be an asset during a rally but has to accept that many will just close their ears when he croons! Sure things started way in 1981 ? Depends on how you look at it. Today in our department of statistics, only fertility rates after 1980 were shown. Are you aware that our fertility rates hovered around 4-5 in the 1960s ? Why the drastic drop and why the selective cut off in presentations to citizens instead of showing the entire history to learn something from it ? all staged, like the mil$ pm at the open air free picnic concert, with mil$ wife TH boss and little grandkid. plus the pm wearing socks with holes in them, for all to see..
just to show that theyre in tune with the common folks? oh pleeeeez! You sound so totally brainwashed conned by pap peeing and pooing rhetoric gambits. You write so much to unwittingly reveal the true non imdependant thinking ability of your mind. Keep it up to be mind slave of dictators and con politicians. Who have captured your mind for their picking for their selfish gains. Smart boy you are!! !